Act Smart UK in Great Barr Birmingham are specialists in minor to medium car body repairs and boast over 10 years industry experience. 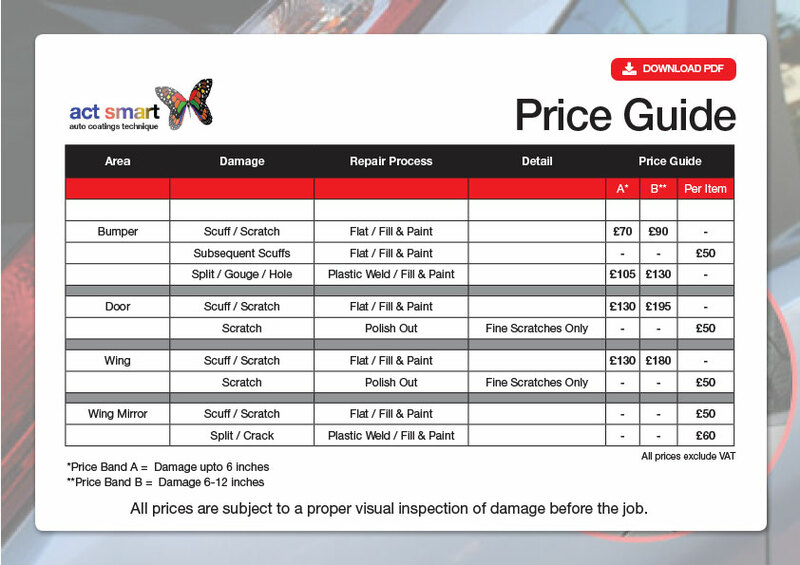 Act Smart provides a dedicated service for repairing car paintwork scratches; bumper scuff repairs, plastic & bumper welding, minor dents and panel rust repairs. All repair work is done in their own work shop located in Great Barr Birmingham and customers have the flexibility of a vehicle collection and drop off service. Act Smart use modern and environmentally friendly hydro paint systems to offer a more economical and cost effective solution. All repair work done by Act Smart is carried out in a sheltered environment without worrying about outside elements that can result in a poorer finish. No job is too small for Act Smart as they posses all the tools and techniques to repair all cars, vans with brands including Fords, BMW’s, Mercedes, Audi’s, Volkswagens and so on. All repair work including vehicle scratch removal, bumper scuff repairs, plastic & bumper welding, minor dent repairs and panel rust repairs will be fully guaranteed and customer can be rest assured to receive their vehicles in pristine condition. So if you require minor to medium paintwork scratch repairs, bumper scuffs repairs, plastic & bumper welding repairs, minor car dents and panel rust repairs and are located in or near Great Barr, Birmingham, West Bromwich, Perry Barr, Barr Beacon, Sandwell Valley, Handsworth, Aston, Kings standing, Walsall, Dartmouth, Witton, Erdington, Gravelly Hill, Oldbury, Birmingham City Centre, Sutton Coldfield then Act Smart can help!